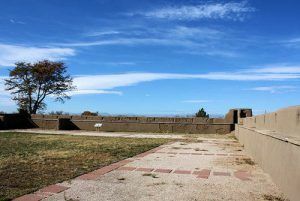 Fort Vasquez was a fur trading post built by Louis Vasquez and Andrew Sublette in 1835 for the Rocky Mountain Fur Company, it was situated along the South Platte River in Colorado. After obtaining a trading license in St. Louis, Missouri from William Clark, the Superintendent of Indian Affairs, they began to trade with the Cheyenne and Arapaho Indians in the area. Strategically located between Fort Laramie, Wyoming to the north and Bent’s Old Fort, Colorado to the south, and situated along the Trapper’s Trail, the trading post was successful for several years, eventually hiring many of their trapper friends including Baptiste Charbonneau and Jim Beckwourth. However, when the price and demand for beaver pelts declined, the adobe trading post was sold to the firm of Locke and Randolph in 1840. That firm later went bankrupt and Louis Vasquez and Andrew Sublette were never able to collect the entire amount of the sale. In 1842, the post was abandoned. By 1932, only the foundations a few feet of the exterior walls remained. Two years later, the owners of the Fort Vasquez Ranch deeded an acre of land surrounding the fort to the Weld County. In 1935-36, Work Progress Administration crews rebuilt the walls from existing bricks on the location, complete with its guard towers. Today, it operates as the Fort Vasquez Museum, located at 13412 U. S. Highway 85 in Platteville, Colorado. By Kathy Weiser-Alexander, updated July 2018.